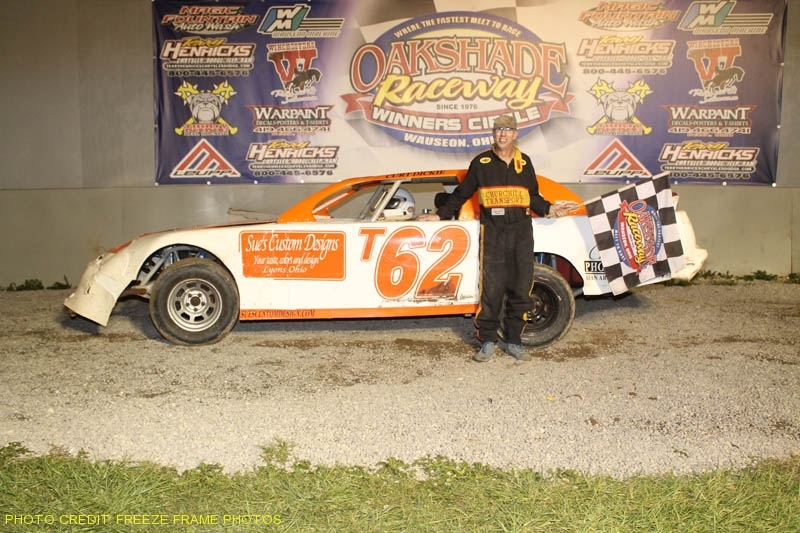 Oakshade Raceway hosted some of the best racing action of the year Saturday night with an ecstatic Dusty Moore winning his first UMP Late Model Feature at Oakshade in his 14 years of racing there. B&P Wrecking sponsored the nights events with over 50 UMP Late Models checked in to the pits by race time. Moore, started on the pole of the 25-lap feature but Duane Chamberlain got the lead by the completion of lap number one after starting right behind the 75 car of Dusty Moore. Chamberlain continued to run the inside groove through the turns while Moore stayed up high and eventually had enough momentum to pass Chamberlain for the lead on lap six. Kris Patterson followed Moore on the outside into second as Chamberlain slipped back through the top five continuing to hug the inside. Oakshade Raceway Late Model points leader, Rusty Schlenk, suffered serious mechanical problems one lap later when fire erupted underneath the 91 car bringing out the red flag so that track personnel could extinguish the flames. Schlenk did not return. Then, coming off turn four on the restart, Ronnie Perrine, Jr. lost a wheel and all heck broke loose behind him as Bill Hahn slammed the front stretch wall and Dean Anderson stuffed his car into the back and under Hahn right in front of the flag stand. The red flag flew once again so the track crew could get the cars separated with the assistance of a fork lift. Things finally settled down with Moore continuing to lead Patterson until lap 15 when Justin Paxton, who is second in Oakshade Late Model points, got by Patterson for second on the track and then began to hound Moore for the lead. Paxton made a good run to the inside of Moore with three laps remaining, but Moore fended off the challenge. Paxton regrouped and as the two leaders got into some slower traffic on the final lap, Paxton darted to the inside in the final set of corners. Dusty Moore was able to barely hang on to pick up his first feature win ever at Oakshade Raceway. Moore said after the race and after jumping jubilantly up and down on the roof of his car that he has won at tracks across the country, but his win at Oakshade was the most satisfying because of the number of competitors and the level of competition. The B&P Wrecking sponsored Justin Paxton finished second and came to congratulate Moore in victory lane. Patterson held on to finish third with Chamberlain taking fourth. Brian Ruhlman posted a top five finish as well followed by Hillard Miller who transferred into the feature through one of the two consolation races and had to start near the tail end of the feature line up. There wasn’t much time to catch your breath before the UMP Sportsman Feature took to the track with Josh Steinacker looking for his seventh consecutive feature win. Chris Smith who used to dominate the Oakshade Sportsman division a few years back, started on the pole and led the first four laps until Steinacker and Rusty Schlenk went by on the outside to take over the top two positions. With Steinacker leading, Schlenk got to the inside to challenge, but a yellow flag for Brian Fisher who was running in the top five put the field back single file. Steinacker continued to lead with Schlenk in pursuit as they closed in on a pack of slower cars on the final lap which set up a spectacular finish. Schlenk dove to the inside and was ahead as they came off turn four coming to the checkered flag. Steinacker squeezed between Schlenk on the inside and a slower car on the outside. Contact was made and Steinacker’s car flew in the air and landed on the back of Amy Bernard’s vehicle as they crossed the finish line with the nose of Steinacker’s car up in the air and just about a foot ahead of Schlenk. After the race, Steinacker was a bit sore and apologized for the contact at the crazy finish of the UMP Sportsman Feature. With Schlenk’s second place finish, Steinacker did not gain much ground in the Oakshade Sportsman point chase which still has a few weeks to go. Ray Klawitter got by Chris Smith to finish third and Tim Fisher finished behind Smith in fifth. Tom Ordway added to his Bomber points lead by picking up the victory in the Bomber A Main after starting on the outside of the front row. Ordway won a three-wide battle for the lead on the first lap and went on to lead all the way to the finish with Dan Dippman running second most of the race. Jim Scout got by Dippman on the final lap to finish second forcing Dippman to settle for third. Kevin Hanford held on to finish fourth ahead of Jake Rendel. The win was Ordway’s fifth of the year. Garry Domoe started at the tail of the Bomber B Main and worked his way to the front to set up an exciting photo finish with Karl Spoores. Chris Dotson led early, but Spoores took command on lap two. A series of caution flags kept the field tight and allowed Domoe to move into second by lap six. Domoe actually got by Spoores for the lead near the conclusion of the race, but Jeff Geis lost a tire on the backstretch that brought out the yellow flag and saved Spoores lead. That yellow set up a one-lap shootout to the finish. Domoe got to the inside and battled side by side with Spoores all the way to the checkered flag with Domoe getting the victory by just inches over Spoores. Dotson held on to finish third followed by Cody Tredway and B.J. Gregory. The exciting finishes continued all the way through the final event of the night, the Bomber C Main. Jeff Foks led most of the race with Bob Rendel second and lapped traffic once again played a part in the outcome on the final lap. Going into the final set of corners, Foks had the lead and went to the outside of a slower car while Rendel shot to the inside. Foks got forced way up the race track and had to back off allowing Rendel to come off turn four with the lead and the win. Foks settled for second with Rob Anderzack finishing third after starting deep in the field. Gary Feldkamp and Corrina Belcher rounded out the rest of the top five. Saturday, August 26 will be Season Championship night for the UMP Late Model division at Oakshade Raceway with Rusty Schlenk leading the points. UMP Sportsmen and Bombers will be back in action as well with gates opening at 4pm and racing at 7pm.